This Company has ceased trading, or is otherwise no longer operating. 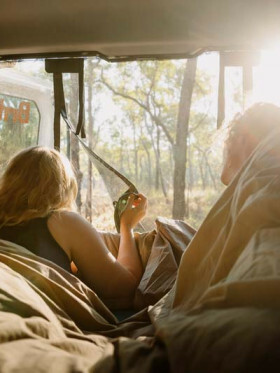 Have you experienced All Seasons Campervans? Help others learn about this company by sharing your first-hand information with other road-trippers. 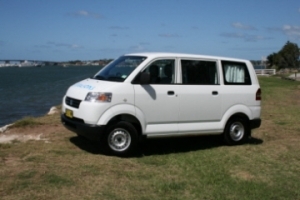 Their rental arm is AutoSleepers a family campervan rental company. The rest of this article is now deprecated but is kept for historical reasons. All Seasons claim to provide excellently stocked vehicles with cutlery, crockery, linen and other amenities depending on the model hired, and easy-to-drive campervans are a point of emphasis for the company. 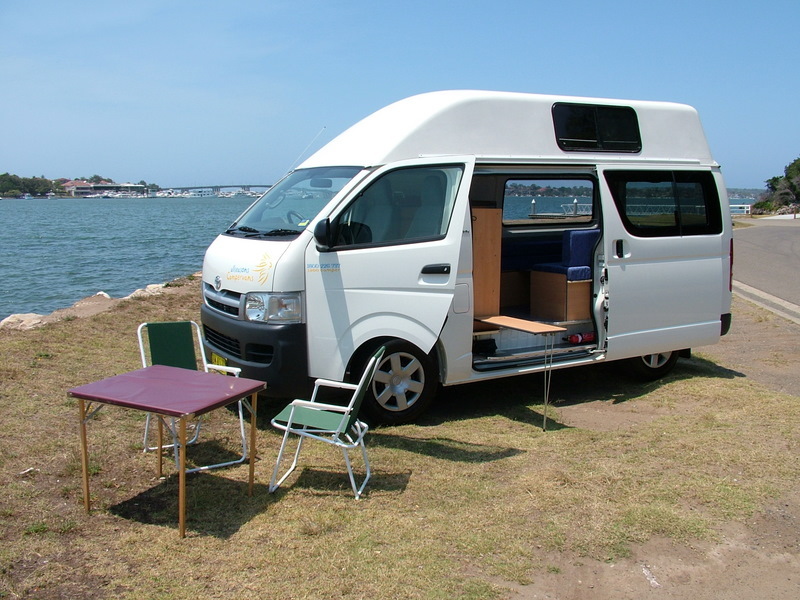 As well as providing a hire service, All Seasons do campervan customisations and conversions, and sell both vehicles (built in the Sydney workshop) and parts. Ranging from the rather unique Mini Camper to the full-blown, self-contained 6-berth Luxury Cruiser motorhome, All Seasons have a diverse fleet on which they pride themselves. 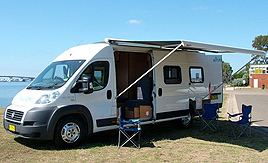 This level of variety is great for travellers who are undecided about the best model to suit their needs, although it does mean that All Seasons have no particular ‘speciality’, unlike some companies which focus strictly on offering smaller campervans or family-favourite self-contained motorhomes. 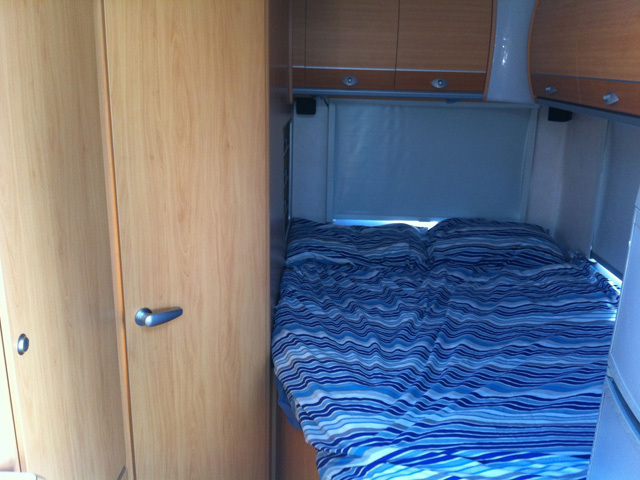 They also offer a combination car-and-caravan hire. Most of the vehicles in the fleet are new or close to it, and low-kilometre, but some customers have reported on their unfortunate encounters with campervans over a decade old, with hundreds of thousands of kilometres on the clock. Luckily enough, this seems to be a rare experience. Crockery, cutlery and linen is included with all models. 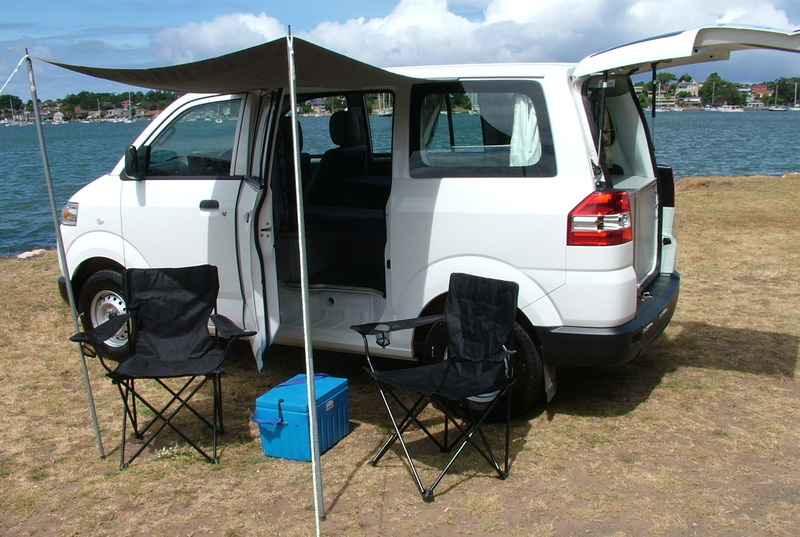 Awnings and camping chairs are provided free of charge with hire of the Mini Camper and Hi-Top — this is great when you consider how many companies hire them out at fairly high prices. All Seasons vehicles start off with the very petite Mini Camper — a ‘bare minimum’ model as a (thankfully air-conditioned) Suzuki with a 1.6-litre engine, which means it has excellent fuel economy at 8 litres per 100 km. 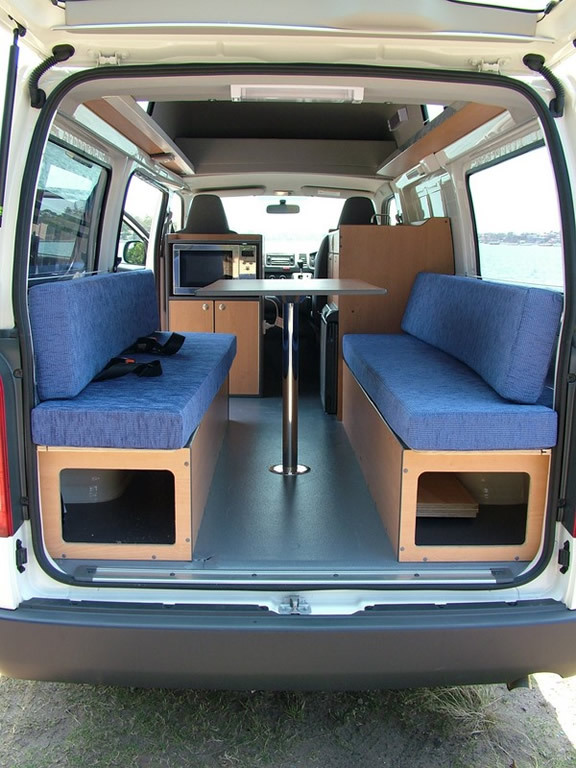 This tiny campervan sleeps an absolute maximum of two people, but due to its size (the bed is only 190 by 150 centimetres, or 74 by 59 inches) it’s probably best suited for solo travellers — under 6’0” preferable! Although All Seasons claim it has “innovative storage space”, realistically, you’ll have a hard time in this camper if you’re not travelling light. It features five-speed manual transmission, and has a gas stove and ice box (you’ll need to keep an eye out if you’re taking spoilable food), plus a solar-heated portable shower and a CD player. However, there’s no inside light, which might prove a pain. A step up from the Mini Camper, the Toyota Hiace-based Hi-Top has seatbelts for four. 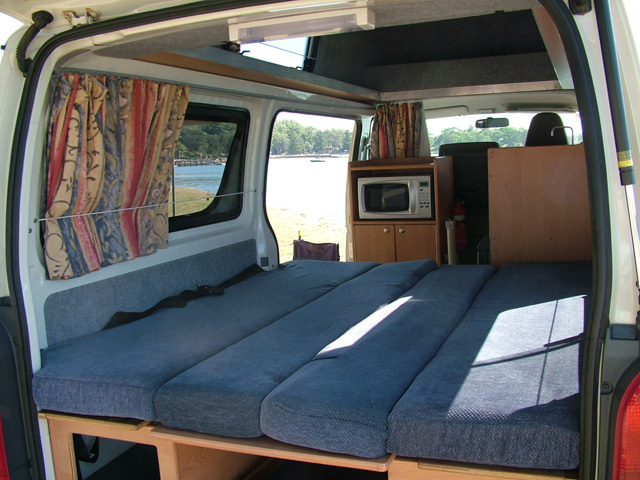 It can sleep up to four people — this is an unusual configuration for the model, with up to two fold-out double beds, one above the other (be warned that this leaves all sleepers with very little head space). It has five-speed manual/auto transmission; air conditioning and heating, as well as a solar-heated portable shower and inside lighting, make this an all-season model. Thankfully, it features a fridge, sink and gas stove, along with a microwave. The 4-berth motorhome, a Toyota Hilux, sleeps the same and is much more spacious than the Hi-Top — very much recommended if you can afford to treat yourself to more space. Automatic transmission is available, with air conditioning to boot. Anyone considering a longer trip with multiple people should take this model as the bare minimum because of its storage capacity; it’s unfortunate but true that the Hi-Top can really only accommodate a week or so’s packing for more than two. It features a gas stove, large fridge and a hot-water system, and the double beds are separated (one above the cab ands one at the rear) to give sleepers a little more privacy. 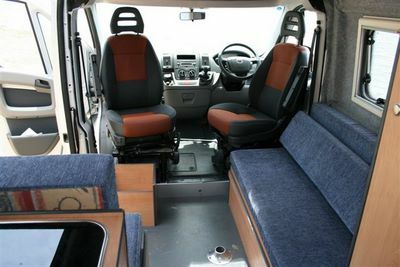 In the daytime configuration, it’s large enough but hardly roomy, with lounge and dining space for four. It also has baby and booster seat anchoring points, so for families, this is the first model to consider in ascending order of size. Moving on, there’s a 4-berth self-contained motorhome — identical to its sibling but for the toilet and shower situated inside the vehicle. 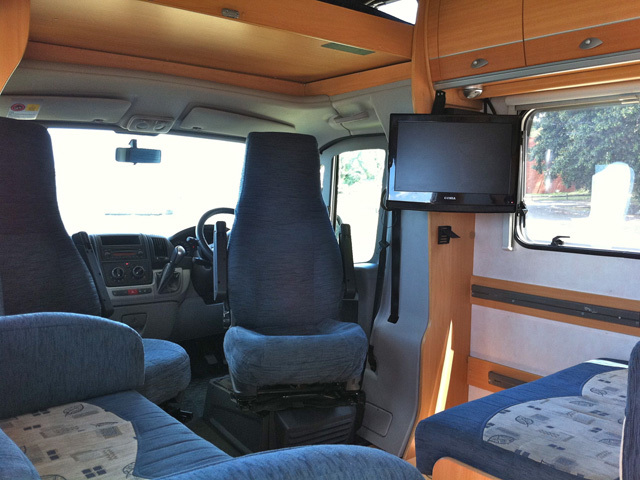 The self-contained Fiat Cruiser motorhome has no overhead, reducing its fuel consumption to 10.5 litres per 100 kilometres, but still sleeps and sits four people comfortably — if fuel economy is something that’s on your mind, this is a good option. It has a six-speed gearbox, and automatic transmission is available on request (although All Seasons do warn us that you may have to pay for this). A 103-litre fridge/freezer is great if you’re travelling in a group, and it also features a microwave (but no gas stove, which is unfortunate). The air-conditioned Luxury Cruiser is All Seasons’ premium model, accommodating six people, with six-speed automatic or manual transmission. It is, of course, spacious, with three double beds in the front, middle and rear (equipped with privacy curtains) and a large living area, along with hanging wardrobes and cupboards. If you’re planning to save money by cooking all your meals, this is the ideal model, with a four-burner gas stove, grill and oven and capacious fridge/freezer. It features a chemical-flushing toilet system and shower. 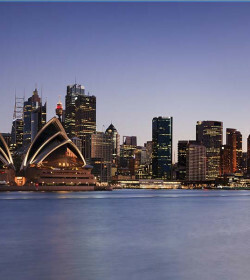 A refundable security bond — payable in cash at the Sydney office, and otherwise by credit card only — is required before commencement of the rental. For the Mini Camper and Hi-Top models, the standard excess is $2,500 — which can be reduced to $1,000 by paying $18 per day, or nil by paying $25 per day. This latter option includes cover for one tyre and one incident of damage to the front windscreen. 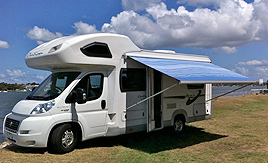 For all motorhome models, the standard excess is $3,000; a payment of $18 per day reduces it to $1,500, while $25 per day reduces it to $500, including cover for one tyre and one incident of damage to the front windscreen. Cover for tyre and windscreen damage only is also available, at $12 per day. Although most customers report no problems, one issue that has arisen several times seems to be the condition of the vehicles — poor maintenance is a particular problem, with some vehicles missing headlights or having dents and scratches on pickup, which if not inventoried at the start of the rental may cause problems with insurance. However, the customer service is good by most accounts, with hardworking staff and timely replacements where needed. This family company is a small one with a few bad reviews across the board, but on the whole, it’s one of the better ones. All Seasons’ wide range of vehicles is great if you’re undecided. They also have plenty of depot locations, which takes some of the fuss out of returning a vehicle. Some of the unusual models are interesting, and probably worth a hire if they suit your needs. Unfortunately, they’re not very cheap. Multiple negative reviews among the positive ones don’t put All Seasons in a good light. The quick-booking system on the website is shoddy. 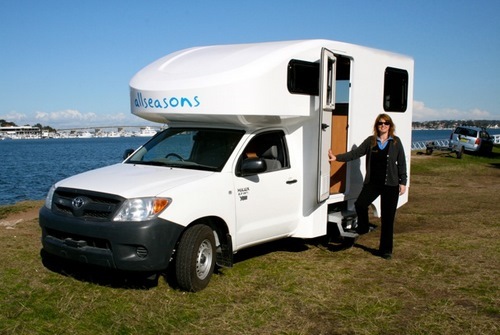 Have you experienced All Seasons Campervans?